11 years and above Children aged 10 and under go free and do not require a ticket. Children under 16 must be accompanied by an adult at all times. VIP 11 to 17 years Enjoy true VIP status with access to the exclusive VIP Garden with private bar and seated area and luxury toilet facilities. Nottingham City resident discount tickets can be purchased from splendourfestival.com or in person from the Nottingham Tourism Centre. To claim Nottingham City resident discount, a copy of your council tax bill is required. 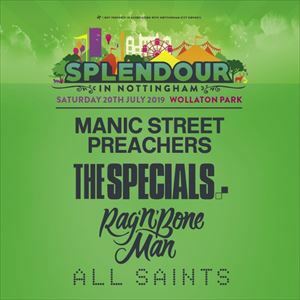 Manic Street Preachers and The Specials will headline this year's Splendour, Saturday 20 July 2019. The two bands have an outstanding back catalogue with more than 20 combined UK top 10 hits, including 'If You Tolerate This Your Children Will Be Next' and 'The Masses Against The Classes' from Manic Street Preachers, and 'Too Much Too Young' and the legendary 'Ghost Town' from The Specials.